And now I’ve forgotten to post through March… which is a shame because it was a huge improvement over February. Not only a big uptick in the quantity of observing opportunities, but lots of variety in my observing diet too. Both this month and the last have started with some Lunar observing. I’m starting to take this increasingly seriously just as the Moon is due to sink lower in my sky until it disappears behind the house until Autumn… still you have to start sometime, and I’ve decided now with the Charles Wood’s Lunar 100. Which is why I’m very happy to welcome the return of solar observing. As the Moon sinks, the Sun is getting higher in our northern hemisphere skies, so it’s around now that I start to swap lunar for solar observing. Despite being around solar minimum, with relatively few sunspots to be seen, I’ve been rewarded with some Hα fireworks and spectacular white light sunspots in the last few weeks. Few in number perhaps, but the quality was undiminished. Planetary observing wasn’t left out as I followed the sliver of Venus up to the last possible moment. For me that was the point it fell behind the houses and trees to the west at sunset on 15 March 2017, but it was a very thin crescent by then: I estimated 5% and Stellarium claims 4.4% illumination. I’ve caught a glimpse of Mercury at sunset too. There were several Jovian sessions, even though it’s a bit too low to see well from my back garden. I can observe Jupiter low to the SE over the top of my garage for about 30 minutes before it goes behind the house. No moon transits yet, but a look at a slightly washed out Great Red Spot (GRS) was possible in my 60mm refractor. Why the small scope? To have any view I have to pick my position carefully, and you try manhandling a large telescope into the garden undergrowth. I’ve tried to spot the comets 45P/Honda and C/2015 V2 (Johnson) with my binoculars, but with no success. At first they were too faint or low, then the Moon arrived and I haven’t bothered again. Once the Moon disappears I’ll certainly try again for the latter of the two at least. March witnessed the arrival of British Summer Time (BST) which heralds the rapid shortening of night in these parts. Naturally in astronomical circles this is never well received, and Deep-Sky observing isn’t going to be easy! By the end of May there’s no astronomical darkness for a couple of months, but in the meantime there can be some lovely transparent skies for the patient. After a rather wet period in the middle of March, during which the Moon got out of the way, clear skies returned just before BST inflicted itself upon us. I’ve started working on the Herschel 400 list again. This spread of several nights gave me the chance to start on the faint and fuzzy galaxies of Spring, as well as polishing off some surprisingly faint open clusters from late Winter. Finally, I’ve collected a few more variable star observations thus clearing the backlog a bit and responding to an AAVSO alert on AG Dra (one I regularly follow). The conditions haven’t been great for it: patchy cloud doesn’t kill a lunar session, but it makes reliable binocular variable estimates pretty tricky. Still it’s nice to be logging some data again. So a March was a much better month and April has started in stunning style with observing sessions on each of the first seven days! 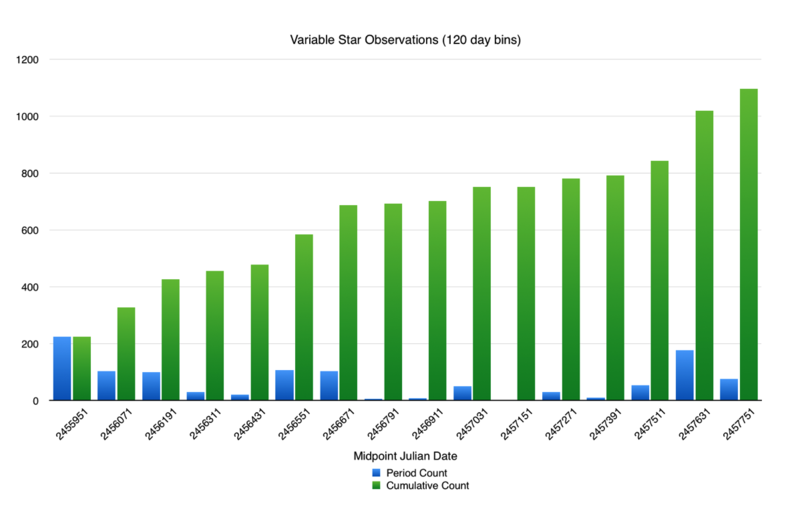 As a follow up to the post on starting out observing variable stars I thought I’d talk about my journey. I started variable star observing about four years ago with the naked eye and the 10-Star tutorial. I soon moved on to binocular variables, to which I’ve added a smattering of telescopic Mira variables now. As you can see below, fuelled with enthusiasm soon clocked up 200, receiving a certificate from the AAVSO for my first 100, which was unexpected. Then the observation rate started to drop for various reasons including the appalling weather, British summer time (these two are often linked), and the pursuit of other astronomical interests. It stalled drastically after the first 600. My variable star observation count up to 19 January 2017. Well at the end of 2016, I decided it was time to pick up the slack and at least push through the 1000 observations barrier, which I did on 5 October 2016. At the time I generated the chart for this post I was handful short of the 1100 observation mark, but another clear night has put me well over the top. I’ve got a telescopic aperture limit of 6 inches and a relatively light polluted site so those exciting, but faint, cataclysmic variables are off the menu for me. Eclipsing binaries are fine, but the most valuable observations of these are CCD photometric these days: visual observers need not apply. Most of my efforts are aimed at Long Period Variables (LPVs) with a few other types thrown in for variety, and delta Cephei for nostalgia. My back garden has a terrible horizon for an amateur astronomer. Houses block most of the lower 30 degrees of the sky to the south and east, there’s heavy light pollution to the west now from an industrial estate, but I’ve a much better northern horizon. For that reason I tend to favour circumpolar constellations that are accessible all year round, providing an unbroken record of observations. I’m concentrating on Cassiopeia, Cepheus, Draco, Ursa Minor and Ursa Major. There are currently 49 variable stars on my observing list of which I have to admit only 30 get regular attention at the moment, and all of those are in the constellations mentioned above. I use a combination of instruments depending on the brightness of the star and the sky conditions. I can monitor variables with magnitude brighter than 5 with my naked eye (as long as I’ve got my glasses on!). A pair of 2.1x binoculars extends this to 7, but from around there down to magnitude 9 can be handled by a 10×50 binocular on a good night, and 15×70 binoculars for the fainter end on a night of poor transparency. These can be pushed to magnitude 10, but around that I fall back on my first telescope: a Skywatcher 130P (130mm F5) newtonian. With the right eyepieces it provides good 1 and 2 degree field of view, which is plenty of room for the variable and comparison stars near the centre. My final limit is about magnitude 12–13 depending mostly on altitude and transparency. A good example is the recent CTA 102 quasar which reached around magnitude 11.5 and should have been possible. But by the time I had a clear sky – bad weather – CTA 102 was low in the western sky glow and had faded to magnitude 12.7. With the Moon right on its doorstep it proved just too faint for any of my telescopes. I suspected as much, but its not every day you get the chance to see something eight billion light years away with your own eyes, so I had to have a go! I found the field stars, but no quasar. I could have filed a “fainter than” observation, but it didn’t seem worth it when I was limited to 11.4. I try to observe these rare opportunities – the Nova V339 Delphini and SN2014J in M82 spring to mind – as they’re not often within my range of magnitudes or a part of the sky I can see. Making regular observations of selected stars really has its benefits though, quite apart from the fun of following their progress. Practice makes perfect and with the comparison stars fresh in my mind I can manage one observation every three minutes, which is quick by my meagre standards, and maintain this rate for a couple of hours. I just noticed on the AAVSO website that I might get another award for the first 1000 observations. I also noticed that the next milestone is 5000!